Somebody forgot to light a fire under La Salle Prep's boys' basketball team before Tuesday night's season opener against Churchill. As a result, the game got really ugly, really fast. Brian Goracke scored 15 of his team-high 21 points in the first half and three other Churchill players also finished in double figures, leading the Lancers of Eugene to a 77-56 non-conference road win over the Falcons. Silas Bennion finished with 16 points and Kaelan O'Neil and Evan Pia added 10 points each for the Lancers (2-0), who raced out to a 22-6 lead at the end of the first quarter and maintained at least a 12-point cushion the rest of the way. "I'm happy with the win on the road, but we've got a lot to work on," Churchill coach Kelly Bokn said. "I thought we played really hard and pretty efficiently in the first quarter. "After that, I thought we had a lot of breakdowns and then I thought we, unfortunately, played too much one-on-one basketball in the second half I don't know why, but we did." 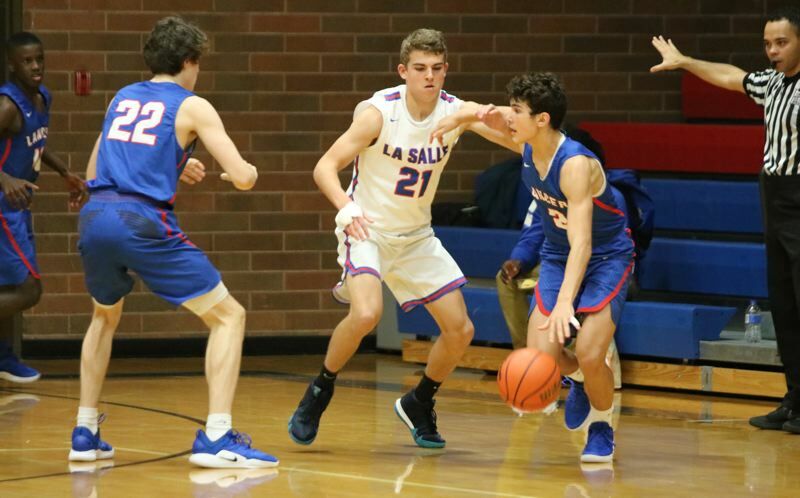 La Salle Prep's Jace Norton knocked down four 3-pointers and led all scorers with 22 points, and Nolan Grogan chipped in 10 points for the Falcons (0-1). "We weren't ready to play on the top 5A teams in the state," Falcons coach Sean Christensen said. "We showed up flat, Churchill got up on us early, and it was too much for us to claw back from." The Lancers were the aggressors off the opening tip, while La Salle struggled through the first 10 minutes of the game to do much of anything right at either end of the floor. The Falcons started 2 from 11 from the field and 3 for 6 from the free throw line with six turnovers and were looking at a 29-8 deficit with 5:46 to play in the second quarter against the perennial Midwestern League powerhouse. "I thought we'd make some more shots to start the game," Christensen said. "We got all the shots we wanted, they just didn't go in for whatever reason. Maybe we got fouled or maybe our guys just couldn't finish, but we got the shots we wanted to start the game." Norton buried a 3-pointer from the left corner 34-22 with 2:31 to play in the second quarter, but Churchill answered with an 11-3 run to end the half and went into the break with a 45-25 lead. After a penalty-filled third quarter that saw La Salle outscore Churchill 13-9, the teams traded baskets through the first five minutes of the fourth quarter and then the Lancers closed the game on a 14-7 run highlighted by Samaje Morgan's behind-the-back pass to Goracke for a dunk that made it 67-49 with 2:10 to play. Did the Lancers tailor their game in any way to try and counteract some of La Salle's 3-point shooting abilities? "Not necessarily," Bokn said. "We've got a style of play that we're going to try to enforce on people. We want to play 84 feet, we want to try to defend, and with that comes a lot of effort and testosterone from the kids. "They' got to learn to tame it down on the offensive end a little bit and execute a little better, but we'll get there." The Falcons were without senior guard Rudy Massaad, who stayed home due to an illness. "Rudy's a big, strong kid who would have helped in a game like this," Christensen said. "I thought Churchill was really physical, and we weren't ready for that. "We did a lot of good things in the game, but there's a tone of stuff that we can get better at. That's the way it's going to be. We've just got to buckle down, watch some film, and move on to our next game on Friday. "This one was disappointing, but I know that's not how we're going to look come March." OREGON CITY 58, NEWBERG 51: Jake Gettel scored a team-high 16 points and Andre Best also scored in double figures with 12 points, helping the Pioneers to a season-opening road win over the Tigers. With the game tied 44-44, the Pioneers got baskets from Eric Nova and Gettel, and went 10 for 15 at the free-throw line as they closed with a 14-7 run. Jack Chlumak led all scorers with 20 points for the Tigers (0-3). GLADSTONE 69, COTTAGE GROVE 48: Thomas Tacha scored a game-high 21 points and Jude Ashpole added 18 points, leading the Gladiators to an impressive non-conference boys' basketball road win over the Lions. Matthew Lehrbach finished with nine points and Drew Pulsipher had six for the Gladiators (2-0), who led 37-28 at halftime and then broke the game open in the third quarter when they outscored Cottage Grove 21-9. Erick Vallejo Giffen scored 21 points and Jasper Nichols Ferguson had 10 points to pace the Lions (0-2). NORTH CLACKAMAS CHRISTIAN 58, COLUMBIA ADVENTIST 41: Caleb Matias knocked down four 3-pointers and finished with a game-high 20 points to lead the Saints of Oregon City to a non-conference boys' basketball home win over the Kodiaks of Battle Ground, Wash.
Hadden Stark added 10 points and Jake Van Lieu and Braden Young had eight points each for the Saints (4-0), who jumped out to a 32-20 halftime lead. Matias had seven points to help spark a 20-6 run in the third quarter that helped extend NCC's lead to 52-26. Trey Hart and Nick Heinrick scored 11 points each to lead Columbia Adventist.